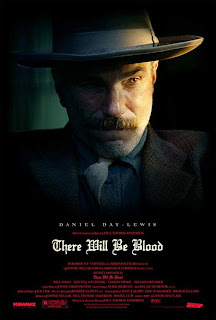 TV Girl: Review: "There Will Be Blood"
Review: "There Will Be Blood"
Heartless yet strangely alluring, swollen with a psyche all of its own, this movie, this presence, this biopic of a startling man, kept me from sleeping most of last night. It peeled back my eyelids like some contraption famed by "A Clockwork Orange," and then, if ever they'd close for a moment, "There Will Be Blood" snarled my mind with dreams of liquid hatred--black gold--oil and the oil man. The Oil Man. The chiseled exterior, chiseled as rock, and a new kind of villain whose limp shall never overcome his greed. "There Will Be Blood" is not a message movie about capitalism. It's not a wayward stretch into the days and times of prospectors and the death and sacrifice that comes with oil wealth. It is a chronicle of one man's insatiable greed, his fears and how they fester in various forms of self-hate, hate for others, hate for the world and all of its parts and for everything but success while those around him fail. But why this hate? What is Daniel Plainview so afraid of? Why is he so avert to discussing his past, his present? Why does he sleep on the floor? Who is he? Well, according to himself, Daniel Plainview is an oil man. He's a family man who runs a family business. The business takes off when soft-spoken Paul Sunday (Paul Dano) materializes from the ether to alert Daniel to the riches that flow beneath the Sunday ranch in Little Boston, CA. Daniel and his adopted son H.W. show up to the ranch disguised as quail hunters, discover a puddle of black, and Daniel is quick to negotiate a price. Abel Sunday (David Willis) is quick to accept a cheap offer; however, Paul's slippery "twin" Eli Sunday (Paul Dano) demands more. Daniel makes the acquisition, however, by paying $5,000 up front and promising an additional $5,000 cash donation to the town's Church of the Third Revelation. Eli, himself, is the preacher of the church. He is a feverish young man, one that yelps and shakes at the Lord, tall and thin as a matchstick clothed in black as he vanquishes the devil with the power of his hands. He wishes to bless Daniel's first well in the area, but is publicly denied, and it is this incident that trips an ongoing furor. Daniel continues, then, to delay his promised donation to the church, and the chilling Sunday/Plainview dynamic gives way to some truly creepy moments, moments that remind me of Stephen King's short story "The Man in the Black Suit," in which the devil manifests himself before a little boy to whisper terrible, horrific things into his ear. Daniel's phrase, "I told you I was going to eat you up," and his climactic milkshake speech have haunted me since the moment I left the theater. These are just two of the myriad deadly musings that Mr. Plainview utters to his surrounding obsolete, most notably, Eli. I am then prompted to wonder, is Daniel, like the man in the black suit, some form of the devil? Is he, indeed, the antithesis to Eli Sunday? Some version of Paul Sunday? Or perhaps Eli is just a nonexistent thing, a reflection of Daniel's fear, of the church, of God's wrath that Daniel holds so dearly in contempt. There are infinite times in the movie when Eli's dialogue parallels the dialogue of others, particularly (and watch for this) the phrase, "Daniel Plainview, your house is on fire." I've heard enough lectures to know that when things feel on purpose, they probably are on purpose, and I don't know exactly what Paul Thomas Anderson has up his sleeve, but I know that it has something to do with Eli, and I'd give my last breath to find out what it is. And it's probably because I spent so much undergraduate time in the trenches of cryptic literature that I've opted to take a different look at "There Will Be Blood." To me, this film is highly literary. It is filled with nods and winks, elbow pokes, magic words and phrases, motifs, things that repeat themselves throughout the duration of the film, things my English 507 class and I would have had our satisfying way with. For it is simply not in my nature to ignore such subtleties. It feels like a novel, slow-moving, unflinching, and graphic, yet it does things with characters that no novel could ever achieve. During "There Will Be Blood," I often found myself hating Daniel while simultaneously fearing him, loving him and watching over him like some distant matriarch, yet also wishing that he'd die. Similarly, sometimes I truly believed Eli Sunday to be real, and other times, I found him to be nothing more than a sort of indescribable hologram. There were even moments when I wondered if any of this had happened at all. It was surreal yet visceral, in many ways like a night terror, one where you find yourself paralyzed, unable to move a limb, and terrified by the figure that stares back at you from the corner. Who is Daniel Plainview? What is Eli Sunday? And does what happens in the end actually happen at all? I'll stay away from spoilers here, because the film is, as far as show times go, becoming more accessible, and I don't want to ruin it for anyone. But if you see it, which you should, I ask you to watch and listen closely throughout the film's final scene. Does it happen? Watch the butler's face. Is it real? Was any of it real? I ask you only because I cannot stop asking myself. "There Will Be Blood" is a crushing success, albeit a blood-curdling trip, and if it were anything else, I'd be reviewing it rather than tossing premature theories around a long and echo-less room. For whatever reason, I can't just write a review. I can tell you what I think of the parts that I can get a handle on, but there's no real way to lay out a concrete point of view for a film that left me blindsided. So here are the things that I know: Daniel Day-Lewis, who I have somehow failed to mention thus far, didn't blow my mind, he cracked my skull, and one can throw around John Huston references all one wants, but I, for one, was flabbergasted. I also find myself in awe of Paul Dano, an actor who, a couple years ago was the dorky kid who saves the day in "Girl Next Door," and is now a radiant blade among a yard of twenty-something has-beens. Also, now, I've finally seen all five Best Picture nods, and my vote still stands with "No Country for Old Men," but it's not because "There Will Be Blood" was worse than the titilating McCarthy adaptation; it's because, to me, it is not really a film at all. It is more of a lengthy character sketch, a screen-novel, a surreal venture into the unreliable psyche of a maniac. But, still, at the end of the day, it's a movie. A beautifully executed chunk of movie that I'll continue to ponder and to write about for many years to come. In fact, I'll probably write about it again, here, sometime in the coming weeks. I wholeheartedly urge you to challenge my strange dealings, to hold me in contempt, but I also urge you to watch this movie and, instead of simply seeing it for what it is on the surface (a greed movie about oil men and their hardhearted ways), see it and watch and listen, and be aware the whole time. Sit with your ears and your eyes wide open, and be prepared to hear strange turns of phrase, words that echo throughout the film, especially among different characters, repeated images, and, of course, allusions to movies of yore. Also, remember that Paul Thomas Anderson is the man who brought us "Boogie Nights," "Magnolia," and the symbolism-heavy "Punch Drunk Love." Then, let me know what you gathered from it all. Maybe we can muster something real. *All five films nominated for Best Picture at the 80th Academy Awards are now playing at the Sundance Cinema in Hilldale Mall. The films are: "Michael Clayton," "No Country for Old Men," "Atonement," "There Will Be Blood," and "Juno." Visit www.sundancecinemas.com for showtimes. Many of them are also wide, but as far as theaters go, Sundance is the shizz. "Um, Affleck please. Hold the Ben."